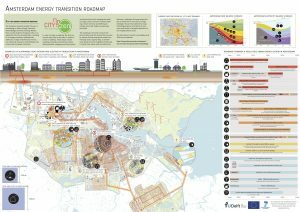 With the City-zen approach, an Energy Master Plan for a city can be made with a roadmap existing of several energy interventions and measures, both at the technical and strategic level and put on a timeline. Replication : The City-zen Approach can be applied to any (EU) city of any size. European cities and municipalities usually have considerable goals in becoming more energy self-sufficient, but are often not on track towards their short-term (e.g. EU2020) targets. The pathways to move forward in the transition towards a sustainable built environment however, are complex to outline. The City-zen methodology may help to give structure within these complex tasks. 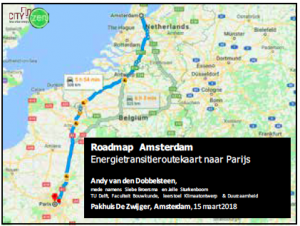 The output will be an ‘Energy Master Plan’ for a city or neighbourhood, existing of several energy maps (demand and potentials) of the city and a roadmap that reaches to preliminary set targets and goals. 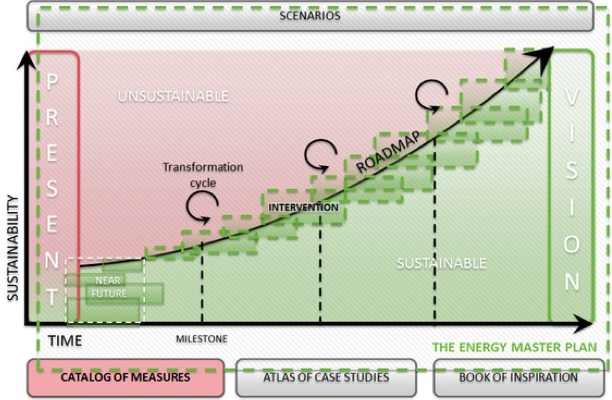 The roadmap exists of several quantified energy interventions and measures, both at the technical and strategic level and attached to a timeline. Energy interventions are technical measures that are specified for a specific location and implementation time frame. 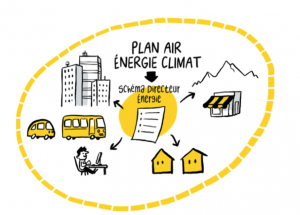 Examples are an extension of a heat network in a neighbourhood, a retrofit of building blocks or the installation of a certain amount of solar power on roofs in a district installed over a certain period. However, to be able to really install or build these interventions, multiple barriers may exist that need to be dealt with. The solutions for these can be on a non-technical level, such as making agreements with housing corporations and home-owners to make connections with the new heat network; stimulate housing corporations to retrofit (by the municipality); give incentives to install PV on roofs (subsidy or a ‘roof letting construction’). These barriers and opportunities can be classified in societal and technical layers of influence, which the City-zen approach implements. The Delft method of Energy Potential Mapping (EPM) already structurally exposes the geographical-physical and technical layers into local layers of energy potentials. This technical-spatial quantification of demand, reduction potential and renewable supply forms the first analytical step of the approach. As said, other layers may affect the realisation of this technical potential on a non-technical and non-quantifiable level. Technically feasible interventions have to be assessed on barriers and opportunities on economic, social and political-legal levels and to take away barriers, strategic measures have to be defined. To develop a full Energy Master Plan in the next steps, the future has to be envisioned in a scenario. So, it has to be defined to what direction the city and its nation is going, economically, socially but also climatically. In a next step, the future targets and goals have to be defined, Amsterdam wants to cut its CO2 emissions by 75% in 2040. With this in mind, the roadmap can be created. 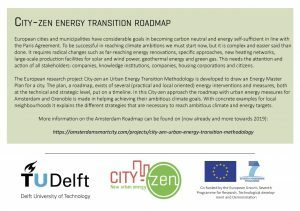 For the City-zen project, the methodology is used and tested in Grenoble and Amsterdam, delivering 2 roadmaps; limited versions of the roadmaps will be provided during the WP9 roadshows. We also intend to make a catalogue of urban energy measures, that not only deals with technical measures, but also takes the non-technical barriers, challenges and solutions for these into account. 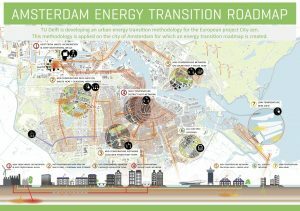 There are several other (European) research projects that deal with energy transition of cities. Some examples: TRANSFORM; CELSIUS; CITyFiED; CONCERTO and others. Some of the distinctive elements of this project are its its eponymous focus on enabling the citizen to contribute to and participate in the required changes, and its aim to include barriers and opportunities on many levels, both technical and societal.